Last week, an editorial by FCSA’s executive director Lynn Norman-Teck was published in the Palm Beach Post. 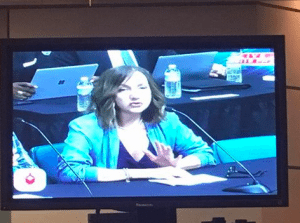 She also spoke before the Palm Beach School Board on July 19 in support of HB7069 and equitable capital outlay funding for all public school students — including the more than 20,000 students in Palm Beach County who attend public charter schools. The Miami Dade district has already spent close to $10,000 to research the constitutionality of HB 7069, and plans to join the lawsuit along with Bay, St. Lucie, Broward, and Palm Beach. FCSA will continue to work on your behalf and the students your serve by voicing support the new education bill, and fighting misinformation. We urge you to join us in this critical fight. Contact us is you have any questions or need more details. The Charter Schools Office at the Florida Department of Education recently issued a memo that outlines the allowed uses of Capital Outlay. Changes signed into law (HB7069) are in effect, and they have an impact on the eligibility criteria for funding and its allowable uses. Specifically, House Bill 7069 removed a paragraph from section 1013.62, F.S., that declared an allowable use for capital outlay. Click here for more details.